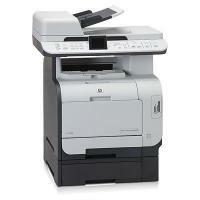 The HP Colour Laserjet Cm2320 is designed for small offices and home users, producing high-quality prints. The printer may appear a bit expensive to the average consumer. The printer supports automatic double-sided printing, reducing paper wastage and saving money. The HP Colour Laserjet Cm2320 toner cartridges comes with four colour ink system, allowing users to replace only the empty colour ink. The device runs on 450 MHz processor with 160 MB of memory which is further expandable up to 416 MB to store a large volume of faxes and prints. At the top, there is a 50 sheet ADF along with a flatbed scanner. There is a large control panel with LCD colour display, PIN pad, memory card port, and navigational buttons located at the front. The printer is capable of handling up to 550 sheets of paper while the output bin can store up to 150 sheets of paper. The Rj-11 fax port, ethernet port, hi-Speed USB 2.0 port, and power cable are situated at the back. The printing resolution of this device is up to 600 x 600 dpi with print speed up to 21 ppm. The printer also supports options for sending multiple copies of scans directly to files or through emails. The maximum monthly duty cycle of this device is up to 40,000 pages, which means the printer is capable of handling large volume of work. The HP Colour Laserjet Cm2320 is a good choice for small offices as it is capable of handling any project which might be suitable for any work environment. It also features duplex printing, wired connectivity, expandable RAM and ADF support. However, it lacks high-volume printing as it has limited paper handling capacity and wireless connectivity which might be found in other laser printers lying in the same price range. The printer has high yield HP Colour Laserjet Cm2320 toner cartridges, reducing the overall cost per page. How to resolve common print quality issues of an HP Colour Laserjet Cm2320 printer? Common print quality issues like, toner specks, ink dropouts, vertical streaks or bands etc. can be resolved either by replacing your HP Colour Laserjet Cm2320 toner cartridges or by following some simple troubleshooting steps. Make sure you do not touch the toner cartridge chip. It is the metallic part of the toner that is used by the printer to indicate the toner level of the cartridge or if the cartridge is installed in the device or not. Note: Replace the toner cartridges only when they are completely empty to avoid the unnecessary ink wastage. You can also get high-quality compatible HP toners which are available online at very low costs and last longer than the originals. Q. How do I replace HP Colour Laserjet Cm2320 toner cartridges once they are empty? Pull out the toner cartridge drawer from the printer. Remove the toner cartridge that requires replacement. Take out the toner cartridge from its packaging. Remove the orange, plastic shield from the bottom of the new cartridge. Insert the new toner cartridge into the cartridge drawer. Pull the tab on the left side of the print cartridge straight up to completely remove the sealing tape and discard it. Q. What is the maximum print resolution that the printer is capable of producing? A. HP Colour Laserjet Cm2320 printers are capable of printing up to a resolution of 600 x 600 dpi for both black and white as well as coloured printouts. Q. Will HP Colour Laserjet Cm2320 toner cartridges also work with an HP Laserjet 1010 printer? A. No, HP Laserjet 1010 printers use a different model of toner cartridges that are not the same as HP Colour Laserjet Cm2320 toner cartridges. You can find toner cartridges for Laserjet 1010 printers as well on our website. A list of printers compatible with HP Colour Laserjet Cm2320 toner cartridges is mentioned here. A. To install the printer drivers on your computer, insert the CD-ROM that you got with your printer into the computer and start the installation process. If you no longer have the CD-ROM, you can download the drivers from HP’s official website. Q. Are compatible HP Colour Laserjet Cm2320 toner cartridges refillable? A. Yes, you can refill an HP Colour Laserjet Cm2320 toner cartridge once it is empty. However, refilling a toner cartridge is a complicated procedure and it is recommended to get your toner cartridge refilled by an expert so that no damage is caused to the cartridge. Q. How many HP Colour Laserjet Cm2320 toner cartridges are available in single cartridge pack and what is the printing capacity of them? A. There is a 5 cartridge pack available that has 2 black cartridges with the printing capacity of 3,200 pages and 3 single colour cartridges that comprise of colours like cyan, magenta and yellow with the printing capacity of 2,600 pages each. Q. How to check the scanner glass for any dirt or smudges, if the print results are not appropriate? Plug in the product, and then use the power switch to turn the product on. Do not use abrasives or other chemicals like ammonia on any part of the product or place the liquids directly on the glass. This can damage the product. Q. I have to print on a grayscale. How can I print a document in a gray scale mode? A. Select the print in Grayscale option from the printer driver to print a colour document in black and white. This option is useful for printing colour documents that will be photocopied or faxed. When the grayscale mode is selected, the product uses the monochrome mode, which reduces the use of the HP Colour Laserjet Cm2320 toner cartridges. Q. How can I set up the status alerts for my printer? A. The use of the HP ToolboxFX is to set up the product so that it shows pop-up alerts to your computer when the certain type of event occurs. Events about which we got alerts include jams, low levels of toner in HP Colour Laserjet Cm2320 toner cartridges, low-quality print cartridge, empty input trays, and specific error messages. You can select the pop-up alert format, the tray icon format, or both for the alerts. The pop-up alerts only appears when you are printing the product from a computer on which you set up the alerts. Q. Why am I getting the lighter or faded prints from my HP colour laserjet Cm2320 printer? A. The media you are using might not meet the printer specifications or HP colour laserjet Cm2320 toner cartridge might be defective. Refer the printer manual to check print media specifications or try replacing the cartridges to get rid of this issue. Q. What to do when I turn on the HP Colour Laserjet Cm2320 printer, and it does not make any sound or if the control panel display is blank? A. Check and verify that the printer is correctly plugged into the electrical outlet with the correct voltage. The printer should be directly plugged into an active electrical outlet instead of a surge protector or power strip. Also, verify that the switch is in the ON position to supply the power to your HP printer. Q. How my HP colour laserjet Cm2320 machine printing only in black colour? Select the colour mode in your program or printer driver. Choose the correct printer driver. Check and replace the empty HP colour laserjet Cm2320 toner cartridge. Q. I am inserting the memory card into the correct memory card slot of HP Colour Laserjet Cm2320 printer. The LED is not lighting. What to do in this condition? A. Make sure the memory card is not defective and inserted into the correct memory card slot. If it is done correctly, it is possible that the circuit board might have been inadvertently damaged by an electrostatic discharge from someone inserting a memory card. In this case, you need to replace the memory card reader assembly. And if the error still persists, you need to replace the formatter. Q. My HP colour laserjet Cm2320 printer is not printing the yellow and cyan colours and every time I print an image it come out with disturbed colours. Make sure you have removed the sealing tape of that particular HP colour laserjet Cm2320 toner cartridge which is missing from the printouts. Use the media that meets the printer’s specifications. Replace the empty yellow and cyan toner cartridges. Q. How to deal with fax sending error codes 322-324 appearing in fax call report or fax activity log? The telephone line conditions were very poor to send the fax. You need to reattempt the fax transmission at the later time when the telephone line conditions may have improved. If the sessions fail by transmitting the large document, retransmit the documents as smaller parts. Q. A colour is printing inconsistently after I have loaded a new HP colour laserjet Cm2320 toner cartridge. A. You need to remove the print cartridge that is printing inconsistently and reinstall it. Also, check and make sure that there is no empty toner cartridge available for your printer. If you find an empty toner, replace it with the new HP colour laserjet Cm2320 toner cartridge. Q. How to get a chronological history of the last faxes that were received, sent, and deleted from HP Colour Laserjet Cm2320 machine? Go to the control panel and press Fax menu. Use the arrow button and select the Fax Reports. Press OK. Select the Fax Activity log using the arrow buttons and then press OK.
Now press OK to select the Print log. The printer exits the menu and prints the log. Q. Whenever I am printing from my HP laserjet cm2320 printer, the vertical streaks appear on the page. A single sheet of the paper a might be defective. Reprint using another paper sheet. Verify you are not using the empty HP colour laserjet Cm2320 toner cartridge to print your job. Q. How to print a fax call report from HP Colour Laserjet Cm2320? A. Fax call report is a brief report manifests the status of the last fax sent and received. Press Fax menu on the control menu. Use the arrow buttons to select the Fax Reports and press OK. Select the Last Call Report by using the arrow buttons, and then press OK. The printer exits the menu and prints the reports.